GOOD MORNING my sweet friends & welcome to day 3 of our sneaky peeks for April! Well, this day is finally here, I've been getting several emails from those who have been PATIENTLY waiting for me to release this set! I did do a pre-sneak of it in Feb! ;) This set is called "Stitched Pretty Flowers & Leaves Dies"! This set has a total of 19 dies in it!!! In my video below, you can see the many ways you can put these flowers together! My design team even has some unique ways on how to use these too! My sentiment is from the set we sneaked yesterday called "Way to Go!" Now onto our 2nd set we are showcasing! It is called "Wishing You Were Here!" OMG, I just ADORE this set soooo much! It includes a total of 10 stamps along w/2 coordinating dies! You can see in my video below how you can use them! The sentiment is also from this set as well. I thought my CUTE bike that we showcased yesterday would look PERFECT in the background! I JUST used the bike die w/no layers & I STILL LOVE IT! I am going to have SO MUCH FUN making cute stuff w/this little bench die!! I can't wait for Halloween to get here so I can used orange lights on my lamp post die!!! Okay, now onto my AMAZING design team EVERRR~! Don't forget to click on each blog to see MORE and to leave my designers some "bloggy LOVE!" Okay, now onto our LUCKY winner from yesterday's sneak peeks! If you missed them, you can see them HERE! Oh My Goodness! (In my Shirley Temple voice!) I am in love with both of these new sets! I can not wait to get to play with these dies and stamps! That bike set is soooo adorable! I love all of the cards that everyone has made! CONGRATS Miss Keysha, I will be emailing you momentarily my friend! Oh my goodness I love the flower set. I know I keep saying this every month but each release just keeps getting better & better. Awesome job design team! Love this... how fun they will be!!! OMG Miss Emma WOW!!! I couldn't believe it when you showed the park bench and street post lamp as when I saw your town yesterday and the bike I said to myself "Oh I wonder if she's going to come out with an old fashioned street light and bench" and here they are sooooo excited. I sooo love the flower so adorable. 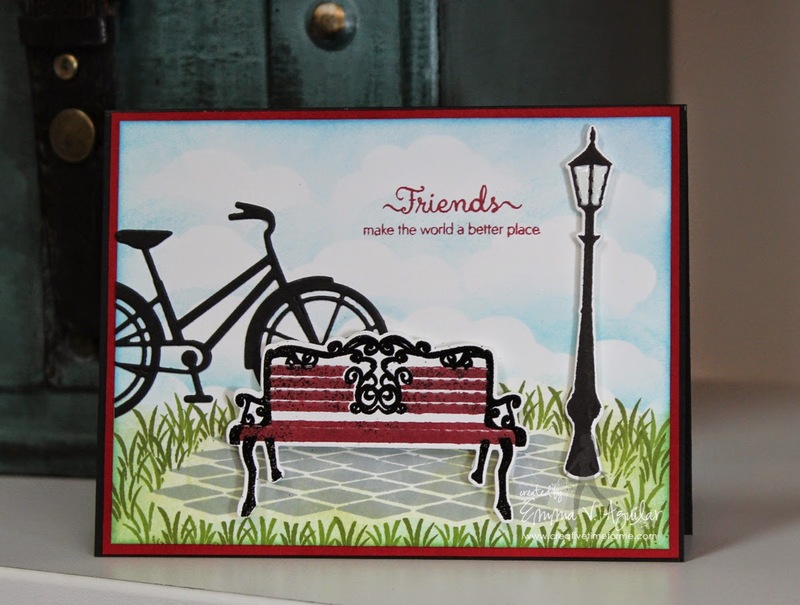 Thanks for sharing all the stamping and cutting tips and trying something new for you too just so awesome of you. Love it all and can't wait to see what you have for tomorrow. Love what your DT has created too.....Miss Emma you are just so talented thanks for everything YOU ROCK!!! OMG, I super love the new dies, beautiful creations, tfs! Omgoodness, these are the ones I have been waiting for!!! I love love love those flowers!! Everything in this release is on my wish list! :) Great projects. Love how you demo them in your videos. Oh oh oh oh oh-this is just the best EVER!!! That Park bench and light are so over the top incredible, Emma. I totally adore them. You think of everything, right down to the gorgeous stamp to put under the bench. Then the flower set with so many layers and different combinations. I can't wait to place my order. This is so a great release-I am loving the new dies! 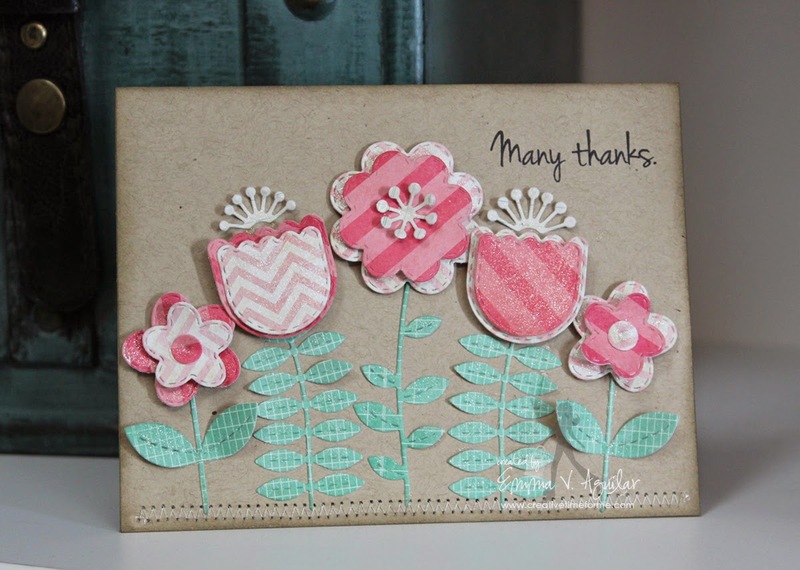 Your flower Thank you card is so adorable! I love it!! You did it! I did not think I could be enticed any more than yesterday's bike but lady that bench is adorable. The sentiment "Wishing you were here with me" perfect...Thanks for the shares. Beautiful cards!! ADORE the flowers!!! Congrats to the winner!! I love all of these new sets! The flowers and leaves are beautiful. The bench and lamp post are so pretty! Great job on this release Emma! Such awesome cards today Emma!! LOVING this new release and everyone's projects!! Wow, I love the flower dies, so pretty!!! Love the new items... the flower dies are so pretty! Such beautiful projects. Just love the flowers!! Love your cards! Those flowers are so pretty and adorable! I can't wait to get these sets! Oh Emma ~ I just LOVE that flower card!! I love how you layers and popped them up then added the Wink of Stella to them ! Simply BEAUITFUL! Oh your bench card is stunning too!!! I LVOE you added the bike! Well you know how I feel about this release and oh my the design team is ROCKIN it!!!! CONGRATS tot the winner too! Hello Miss Emma, you have out done yourself once again. 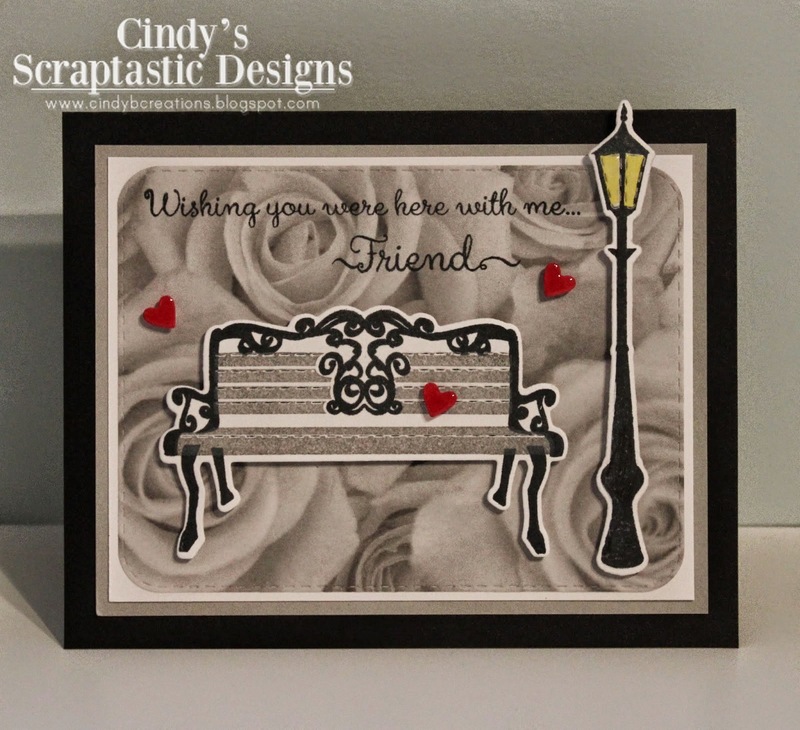 I enjoyed see all of the lovely creations today with the wonderful flower dies and that cute bench and light post die. Can't wait to see what's in store for tomorrow! OMG Miss Emma! Love these new dies and stamps! You are amazing! Your cards are beautiful and your DT rocks too! Omg Emma so many dies!!!! I love this!!!! Flowers and the bench, lamp post are awesome!!!! On the flowers die I see you might make a fern with those one leaves. Great sneak peek today!!! Very cute flowers and love the bench and lamp post. Love, love both these sets. I am new to your product line and am so happy I found your company. I love all the sneak peaks and this one is just too adorable as well! I love the flowers. They will be on my must purchase list! Thanks for sharing and I love everyone's beautiful creations. Oh my goodness, so super adorable! I love the stitched flowers! So many possibilities and the bench with lamp post is so adorable and unique.....again LOVE! What a beautiful cards!!! I love them both!!! 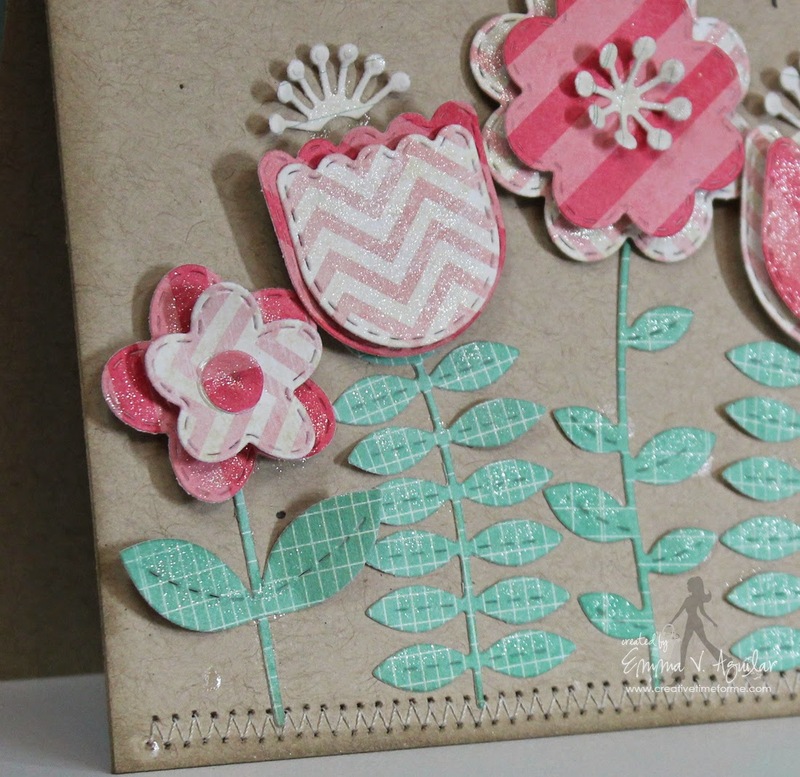 I love your darling, layered, patterned paper posies! So cute! The new bench die is lots of fun too. They just keep getting BETTER & BETTER!!! :) I love your cards and your new dies are to "die" for!!!!!! The font you chose for your new stamps is divine! Love all of the inspiration on today's hop. The projects are beautiful. Ooooooh how pretty! A perfect addition to your collection Emma! Beautiful projects by everyone, as always!!! So gorgeous!!! Can you hear me screaming!!!!!!!!!!!!!! OMG I am in heaven!!!! Super cute. Yay congrats to the winner:)! So pretty, Emma! Such great sneak peeks. Another winning release. Awesome...bright...happiness...are just a few words that begin to describe the stamp sets. I would love to win. Thanks for sharing your time, talents, and ideas with us. Emma love both cards!! I'm so excited about this new release and can't wait to purchase. You have done it again. OMG, everyone did an amazing job! Absolutely wonderful creations from everyone! Congratulations to the winner! I LOVE the bench and lamp post. Thanks fro sharing your wonderful cards Miss Emma. Love the bench & lamppost. So many possibilities with those dies. I don't know which I like best...the florals...no, wait..the bench and lamp post...decisions, decisions. Your stitched flowers are so unique and a cut above most every flows die I've seen and used. Love your cards. Love everything that is being shown today. You and the DT have such a range of talent. Thank you for all you do and for sharing. P.S. Yesterday I forgot to come back and respond to your post. Just wanted to thank you for the great video on putting the bicycle together. It doesn't seem as hard as I thought when I first saw the bicycle. Beyond cute! I definitely have to get this set!! Oh My Word Emma! I love today's sneaks! Great video showing how you put everything together. I can't wait to get this super release! I can't imagine what else you have in store for tomorrow but am pretty sure it will be awesome ;) You and your fabulous Design Team are amazing with your projects. Wonderful job everyone. Oh Emma! This release is just blowing me away! That bench has to be the cutest thing ever. I can't wait to get my hands on it. And the lamppost. And the new flower and leaves. And the ......... Friday is too far away! Yah,I finally got to sit down and catch up on this week's sneak peeks! Your DT is so creative with this release! I really like all the variety of this release! Waiting a few more hours for the last day posting. Thank you Emma for keeping your followers itching for more outrageously gorgeous creations with your products! Beautiful cards Emma!!! I love how you created the scene with the grass!!! I love the park bench. So many things can be done with that. Your guest cards are beautiful. Love the grassy ones too. So versatile. 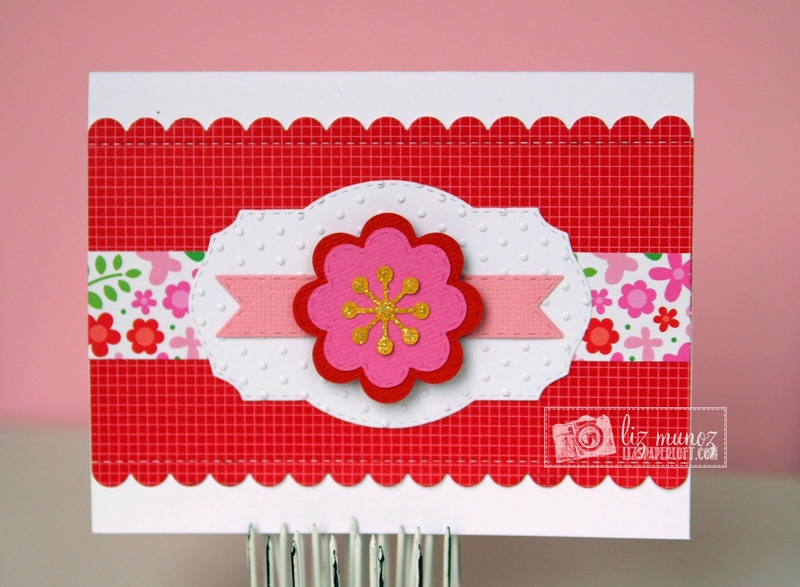 Your flower card is so sweet and pretty, Emma! The colors and patterns are beautiful against the kraft! And then your little scene is just adorable! Great idea to stamp the grass!! !